All i2000 Series guitars are now custom built to order. We typically begin by having a "dream discussion" to discuss your specs. A good starting point is to email us your model and preferences and then we can set up a time to speak on the phone. View Custom Inlay Choices here: Custom Inlay Design. 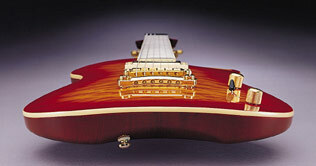 View Custom Shop Color Choices here: Custom Shop Color Choices. You can also email us a picture of any guitar finish and we can match. We can create a new design for you or inlay one of your own design ideas. All of our i2000 Series guitars are available with Fishman Piezo, RMC piezo/13 pin, Graphtech piezo/13pin, including the new Graphtech LB-63 Floyd and our patented, built-in iGuitar.USB system. After a detailed discussion, we will email you a quote with price/shipping and estimated delivery time. Delivery time is about 10-12 weeks for i2000 Series/iGuitars orders right now. We partner with the best manufacturers and suppliers to create the best sounding, best playing guitars and with the coolest, latest technology to enhance your guitar playing creativity.